To gauge the American political landscape in the aftermath of the 2012 presidential election, the Diane D. Blair Center of Southern Politics and Society and the Clinton School of Public Service, conducted a comprehensive national poll of political preferences and behaviors among 3,600 respondents. The 2012 Blair Center-Clinton School (BCCS) Poll, with an oversample of African Americans, addresses the serious dearth of data available to politicians and researchers striving to understand this dynamic segment of the American populace. The United States is projected to become a majority-minority nation for the first time in 2043, a pattern already evident in communities throughout the nation. Whites are expected to remain the largest single group, however, no group will comprise a majority. This demographic shift has had significant impact on electoral outcomes. Exit poll and U.S. Census data confirm that African Americans’ voter turnout levels exceeded whites for the first time. Of all racial and ethnic groups African Americans were the only group to increase their voter turnout in the 2012 presidential election from the 2008 election. This was most noticeable in the Midwest and Southeast, significant areas of the Electoral College map. Commentary concerning African American voting patterns at times has been dismissive and implied that the group naturally votes for African American candidates. This false assumption diminishes the nuanced means in which black lack voters decide on candidates and policy preferences. Historically, African Americans have shown themselves to vote Democratic more than along racial lines. As African Americans continue to increase their political engagement and demographic growth, they have the potential to influence the policy focus of the Democratic Party and the nation. African Americans have consistently supported the Democratic Party and a liberal policy agenda. Perceptions of common or linked fate are credited for the relative unity in policy preferences of African Americans as well as their homogeneity in partisanship and voting behavior. It has been shown that that African Americans can, and do, infer self-interests from group interest more generally. Therefore, as long as group members are aware of disparities that affect group members, they will evaluate policies, parties and candidates with a strong sense of racial consciousness that says their individual outcome is linked to other blacks. The group’s interest has long sought to address racial, social and economic inequalities. Although African Americans have made wide gains educationally and economically as evident in Figure 1, the group continues to face economic adversity. The BCCS Poll reveals the persistent disparities in income and educational attainment for the group. Of the sample, African Americans were the least employed with 18.5% stating they were temporarily laid off or looking for work while only 9% of whites and 16.6% of Latinos reported the same. Those who were employed reported low levels of income, with 55% earning less than $35,000 in comparison to 27.5% of whites; 44% of Latinos. Only 13% earned bachelor degrees in comparison to 21% of whites and 7% of Latinos. African Americans were also the least likely to own a home. Black respondents indicated that 49% rent while 46% own, compared to 76% of whites and 52% of Latinos reporting home ownership. 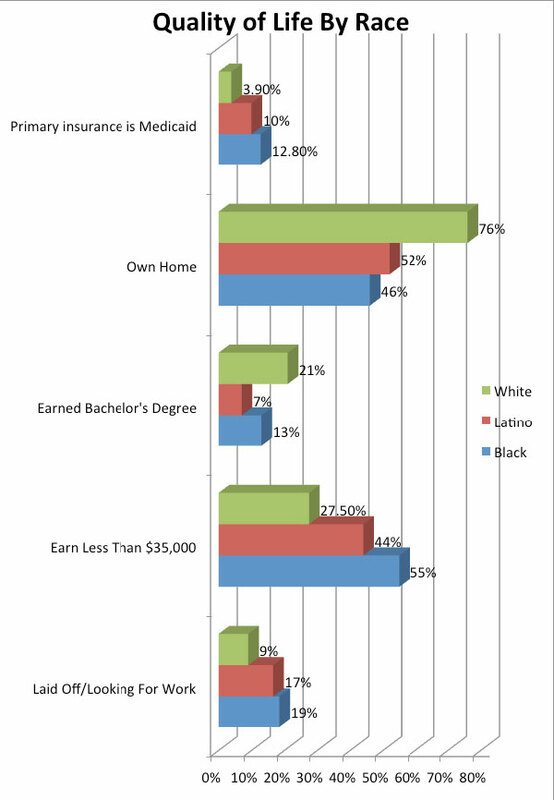 The issue of access to quality healthcare and the persistence of health disparities continue to be problematic for the group with 74% reporting that they have health insurance while 12.8% identified Medicaid as their primary source of health insurance in comparison to 3.9% of whites and 9.7% of Latinos. African Americans’ opinions and attitudes are nuanced due to the varied experiences of group members, marginalized economic position, racial discrimination and a socially conservative outlook as a result of the continued influence of the Black church. Historically, African Americans have been progressive in leading the fight for racial, social and economic justice. African Americans are more supportive than any other group of Americans when asked about state action to redistribute wealth to bring about a more equal and just society. In the literature there is ongoing discussion about the moderation of African American public opinion due to the increased number of middle class members and political incorporation since the 1970’s. African Americans have strongly supported a liberal political agenda. According to data from the 2012 BCCS Poll, African Americans still express strong liberal opinions on political issues and increased liberal support for social issues. A majority of African Americans (57%) say abortion is a personal choice. In the case of gay marriage, 26 % of African Americans are in favor of gay marriage. This is a slight increase from the 22% of African American respondents who were in support in the 2010 Blair-Rockefeller Poll. While 33% are in opposition, the group’s opposition to gay marriage is consistent with 36% of whites who opposed and 32% of Latinos. The issue of immigration is of national importance and has impacted African Americans. Latino immigrants are more likely to live in communities with or are in close proximity to African Americans. Only 30% of the group is in favor of stricter immigration laws similar to the one in Arizona. Consistent with the concern for equality, 72% feel that it is the responsibility of federal government to ensure equality with white in employment and 48% feel that too little attention is paid to racial issues. The United States is projected to become a majority-minority nation for the first time in 2043, a pattern already evident in communities throughout the nation. Whites are expected to remain the largest single group however no group will comprise a majority. This projection has led to a considerable amount of research across disciplines about competition and perceived shared interest between African Americans and Latinos. As both groups share marginalized economic and social position in comparison to whites, access to resources such as education, housing and political power are extremely significant. Although African Americans were a significant voting block in 2012, their marginalized existence weakens their political strength thus increasing the need for political coalitions. How African Americans view Latinos and whites will be critical to their ability to advance their economic and political agenda. Figure 2 reveals that African Americans have a greater sense of political commonality with Latinos than whites. When asked about political power and representation, 36 % reported having some in common with whites while 48% stated the same in reference to Latinos. 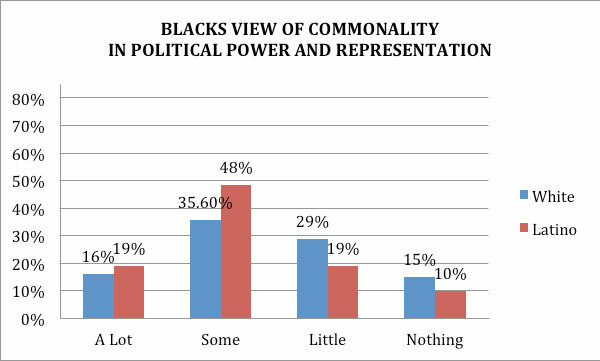 Of black respondents, 43.7% reported little to nothing in common (political power and representation) with whites in comparison to only 29% stating they had little to nothing in common with Latinos. 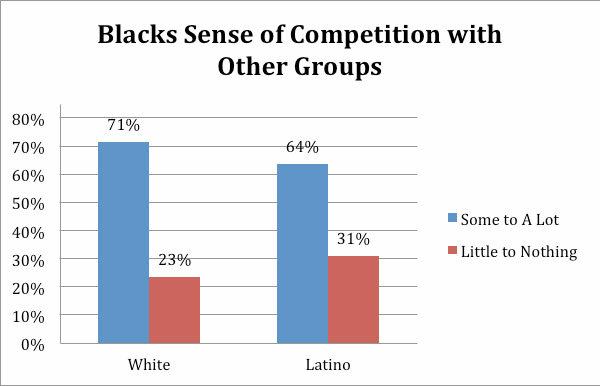 Blacks also view whites with a greater sense of overall competition than Latinos with 71% reporting having some to a lot of competition with whites while 64% with Latinos (See Figure 3). Policies designed to address societal racial inequality are among the most controversial in our contemporary political debates. Much has been written on the limited support among whites for policies created to address racial equality. At the same time, however, there appears to be general support for the principles of equality. In 2010 the Blair-Rockefeller Poll asked respondents about the levels of discrimination various racial and ethnic groups experienced. Data revealed that race was a significantly influence on the day-to-day experiences of African Americans across the country. Data from the 2012 BCCS Poll leads to the same conclusions (See Table 2). An overwhelming majority of African Americans (79%) reported experiencing discrimination in their day-to-day life. Latino respondents reported less discrimination (54%) in their lives compared to African Americans. Interestingly, a considerable 37% of whites expressed that they had experienced discrimination. However, in response to more specific examples of racial discrimination these percentages decline. In light of the racialized experiences reported in the 2012 BCCS Poll it is likely that African American opinion and policy preferences will continue to move to the left. This is potentially significant for American political behavior. African Americans have consistently increased their level of political engagement at the national level when mobilized to do so. If the model of mobilization that occurred in 2008 and 2012 continues and expands to local, state and midterm elections there could possibly be a shift in political power within the South and in other areas where there are large concentrations of African Americans. Unfortunately, the group is still addressing disparities in income, education and health. It will be critical for African Americans to utilize their increasing political leverage to develop coalition partners and seek new forms of activism to alleviate the existing problems throughout African American communities. 2Various analyses argue this occurred in 2008 as well. See Weiner, Rachel “Black Voters Turned out at Higher Rate Than White Voters in 2012 and 2008” Washington Post 29, April 2013. 3Gay, Claudine. “Seeing difference: The effect of economic disparity on black attitudes toward Latinos.” American Journal of Political Science 50, no. 4 (2006): 982-997. Glaeser, Edward Ludwig, and Jacob L. Vigdor. Racial segregation in the 2000 census: Promising news. Brookings Institution, Center on Urban and Metropolitan Policy, 2001.